Handheld shots were used to “amp up the energy” during some sequences, according to Chad Haufschild, producer, cinematographer, and lead editor for Wake the Witch. (Wayne, NJ) JVC Professional Products, division of JVC U.S.A., announces that Unfiltered Entertainment, Inc., used the JVC GY-HD250U camcorder for principal photography of Wake the Witch, an unrated, direct-to-DVD release that is expected to be distributed through Amazon.com and FilmBaby.com this month. Principal photography for Wake the Witch, a new direct-to-DVD feature, was shot using the JVC GY-HD250U camcorder. Inspired by Japanese horror, the 90-minute feature tells the tale of three friends who unwittingly release the vengeful spirit of a witch from her resting place. Written and directed by Dorothy Booraem, the low-budget film was shot on location in Wilderness Park in Lincoln, Neb., and other locations in the surrounding area last fall. Post production was completed earlier this year using a PC-based Adobe Premiere Pro NLE system. Handheld shots were used to “amp up the energy” during some sequences, according to Chad Haufschild, producer, cinematographer, and lead editor for Wake the Witch. 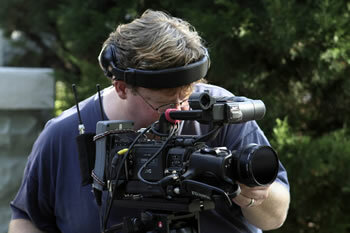 He said the compact, shoulder-mount GY-HD250U was “fantastic” for the handheld shots because of its excellent balance. “Going handheld was easier compared to smaller cameras,” he explained.